To which web directories should you submit your new site in order to get noticed? How do you go about doing so? There’s really just one you need to care about: Google. 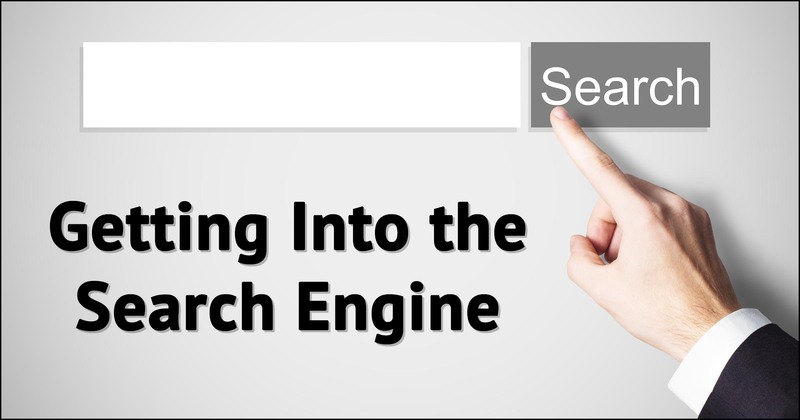 Get you in that most important search index. Position you to get properly noticed by many of the rest that matter. So let’s get your site in Google. A sitemap, as its name implies, is nothing more that a map to your site: a list of every page on your website. But I’m not talking about a human-readable sitemap here. Those can be useful, but aren’t necessarily as detailed as a sitemap generated specifically for the search engines1. A human-readable sitemap is just a page you create on your site. The Table of Contents for Ask Leo! on Business can be considered one form of sitemap, designed for people to actually use and read. There is a website standard for machine-readable sitemaps. The convention is that your site’s sitemap will be present at the root of your site (in a file called “sitemap.xml”), or that your home page will include additional hidden information about exactly where the sitemap is and what it’s called. You’ll find that https://biz.askleo.com/sitemap_index.xml exists. Mine has some formatting applied to make it understandable should you look at it, but most machine-readable sitemaps are full of confusing XML (eXtensible Markup Language). The search engines eat this stuff up. So, how does one go about getting a sitemap? If you clicked on the link to my sitemap above, you’ll have seen the first clue as to how to get one. Ask Leo! On Business sitemap. You may recall that when I recommended the Yoast SEO plugin, I said it did a number of things that are good for search engine optimization. Generating your sitemap is one of them. Once the plugin is installed and activated in WordPress, you never have to worry about the sitemap; it’s generated and updated automatically as you add or change content on your site. If you choose not to use Yoast SEO, there are several plugins available that generate a sitemap for your site. If you’re not using WordPress, you’ll need to determine if your content management system handles sitemaps for you (many do), whether there are plugins or add-ons that can (often there are), or if you need to do something manually. Check the resources and support community for whatever CMS you’re using to find out what’s available and how others are doing it. 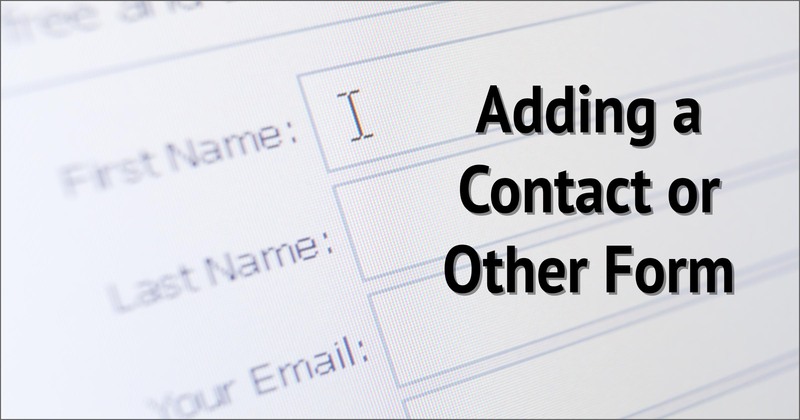 In a previous article, we hooked your website into Google’s Search Console. We’ll return there to let Google know about your sitemap. Click on your site name in Google Search Console to go to its entry. Ask Leo! On Business example site in Google Search Console. On the left, click on Crawl, and then Sitemaps, to go to the list of sitemaps currently known for your site. Ask Leo! On Business example site entry in Google Search Console. Enter the location of your sitemap as indicated. 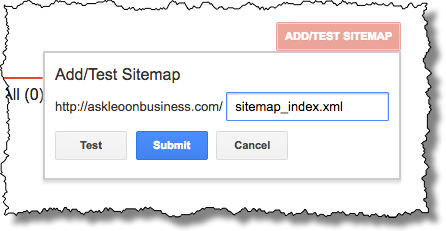 If you’re using Yoast, as I am, then that means entering in “sitemap_index.xml”. The other default is simply “sitemap.xml”. If neither of those end up working for you, you’ll need to check the documentation for your CMS or sitemap generator for the correct name. Click on Submit. Your submission will be acknowledged. Wait a few minutes and then click the Refresh the page link, and you should see your sitemap listed. Google will now, eventually, use your sitemap to index the pages listed therein. You can return here later – how much later varies, and I’ll talk about that in a moment – to see if any errors are discovered. Typically, using a CMS like WordPress, there are no errors. 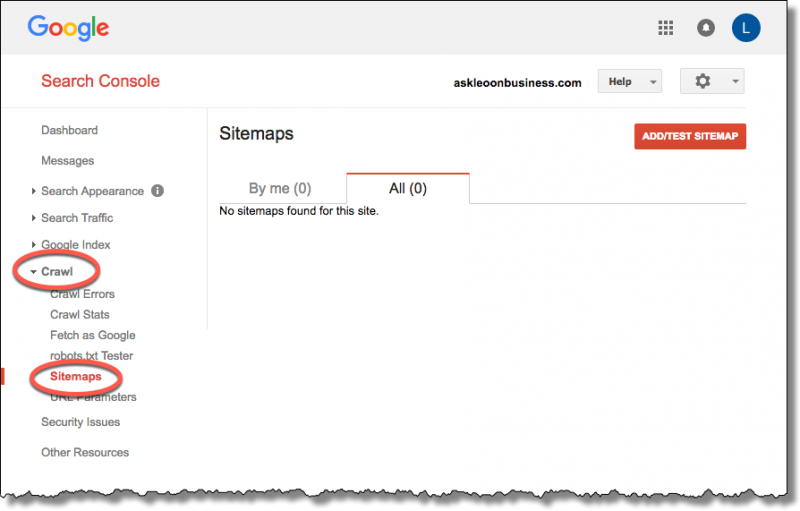 So, you’ve submitted your sitemap, and you’re wondering – are you even listed? How would you know? Particularly if you search for terms you think you should rank for, but you’re not showing up just yet? Simple. Perform a search that’s restricted to only your site. That says search for anything (or nothing, depending on how you look at it), but only on the site askleoonbusiness.com. The results show whether Google has indexed your site yet. If no pages are returned, your site isn’t listed yet. If you get results, you know Google knows about you, and now it’s just a matter of doing all the right things to generate content and have patience while waiting for Google to “get around” to indexing your site more fully. I mention patience on purpose. Particularly when a site is brand new, it can take a while for Google to get around to indexing your site, and updating that index when you make changes. 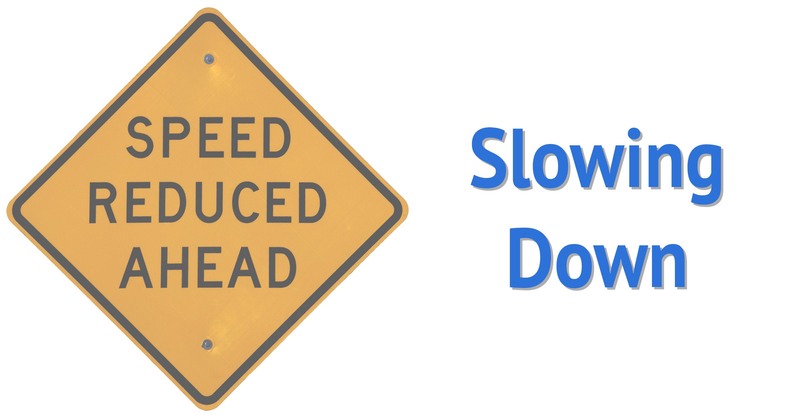 The definition of “a while” varies from anywhere from a few hours (or occasionally minutes)2 to upwards of a month. One of the many reasons I keep pushing you to keep your site active and “alive” by publishing new content regularly is that it’s a signal to the search engines that … well, that your site is active and alive. The implication is it’s worth paying attention to more often, so the search index is kept appropriately up to date. Most all activity counts – adding content, comments, new incoming links from other places, social media mentions – these are all signs of activity to Google. But the only one you really have direct control over is adding content. It’s a simple equation: Add value. Add content. Get noticed. 1: You’ll note that the title refers to the search engine – singular – while here I start talking about search engines – plural. Your focus should be on Google, but things like sitemaps will be used by many, many other search engines and utilities as well. 2: Ask Leo! seems to get updated within an hour of changes, and my position in the search engine rankings is almost always in flux in some way. The site is constantly changing, as are the sites that most commonly appear alongside mine in search results. A monopoly can exist when it is supported by the people. Why are you supporting a monopoly by deprecating other search engines? Nothing could be more destructive to a free world economy because promoting one search engine means one organization gets the power and only one search result gets to the top . When millions of people have businesses using Google’s search index its like getting lost in the biggest sea- every search query is like a net, it can only get so many results. Goggle has an agenda; its economic, political, and global. The chances of getting an honest unbiased search result from such an entity are very very small. Search results will be managed quietly and under the table where lobbyists, government, and private interests groups can determine how they are or are not favored in search results. This creates an unaccountable system that can suppress almost perfectly any information, idea, business, country, ideology, culture, religion, etc, it wants. We need other search engines to prevent that from happening, to provide alternate sources for information for our businesses and society. Please wake up to that need. If you can get more different people to USE different search engines, great. Go for it. But that’s not this audience. Today time spent getting listed in any search engine other than Google is time wasted. I’m not saying that’s good or bad, it just is what it is. Until you are successful at getting more people to use more different search engines, the people who are looking to be found must prioritize their appearance in Google. PS: I don’t subscribe to the conspiracy theories you outline. But that’s actually irrelevant. Again, advising a small business owner on where to spend their precious time, they need to rank in Google. That’s simply pragmatic, practical reality.